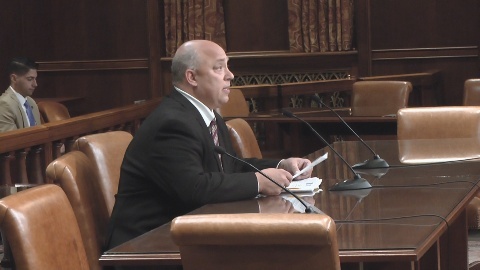 Warren Hudak, Vice Chair of NFIB Pennsylvania’s Leadership Council and owner of Hudak and Company of Harrisburg, testified against Governor Tom Wolf’s tax plan before the Senate Finance Committee. Hudak is a tax expert. The Governor’s tax plan would increase the Personal Income Tax rate by 21% and raise the sales tax and expands it to many services. This is Hudak’s testimony about why the plan is bad for small business in the state. Good morning Chairmen Eichelberger, Blake and members of the committee. My name is Warren Hudak, president of Hudak and Company, a central Pennsylvania-based small-business accounting firm specializing in payroll services, bookkeeping, sales tax services and advanced tax transaction analysis. I am the vice-president of the National Federation of Independent Business (NFIB) Pennsylvania leadership council and chair NFIB’s tax advisory committee in Pennsylvania. NFIB is Pennsylvania’s leading small business organization representing 15,000 small- and independent businesses in the Commonwealth and roughly 350,000 nationwide. NFIB members represent virtually every sector in Pennsylvania’s economy. A typical NFIB member employs five or fewer workers and generates gross sales of $400,000 per year. Small employers make up an enormous segment of Pennsylvania’s business community, employing about half of all private sector employees. About 80 percent of businesses in Pennsylvania are organized as sole proprietors, partnerships, sub-chapter-S corporations or Limited Liability Companies (LLCs). Businesses organized in this fashion report their business income and pay business taxes through their personal returns. The purpose of today’s hearing is to discuss the impacts of the Governor’s proposal for a 21 percent increase in the Personal Income Tax (PIT) rate to 3.70 percent, and to increase the Sales and Use Tax (SUT) to 6.6 percent while expanding the list of items and services (including professional services) taxed to include everything with the exception of food, clothing and prescription medicine. Your committee has also received a bill from the House, HB504, which would call for a 21 percent increase in the PIT as well, while raising the SUT to 7 percent without an expansion of the items or services taxed. Similar to the Governor’s proposal, this bill offers limited and temporary property tax reductions targeted primarily to homeowners. NFIB is a member-driven organization. We have balloted these issues and discussed these proposals extensively with the other members of our leadership council, which includes business owners from all corners of the Commonwealth. Our comments are based on the feedback we have received directly from other NFIB members. As I mentioned, 80 percent of the businesses in Pennsylvania pay the PIT rate as their business tax because they are organized as a pass through entity. Any increase in the PIT will have a significant impact on job creation by increasing the tax burden on small businesses directly. In addition, increasing the sales tax will increase the cost of doing business for many small businesses. Everyday purchases that are necessary to run a business would become more expensive. These purchases include vehicles, equipment, computers, furniture, and many others. The expansion of the SUT base is also problematic for small businesses. Many employers rely heavily on outside advisors, consultants and other professional service providers for tax preparation, legal services, advertising, marketing, legal services, computing and other regulatory compliance functions. Already, small employers and entrepreneurs pay a disproportionately high cost for services compared to larger companies that employ their own lawyers, accountants and IT professionals. Under previous property tax proposals, small employers would be forced to pay taxes on these professionals’ services. While the administration has said business-to-business transactions would be exempt, it remains to be seen whether that could be guaranteed through legislation. NFIB has testified many times about the need to simplify the tax code, including sales tax collection and remittance. It costs small-business owners as much as 13 cents in paperwork and administrative overhaul for every dollar collected and remitted in sales tax. The cost for small business to comply with the current tax code is 66% higher than larger companies. The Governor’s proposal would increase these costs and require owners to pull capital out of the business that could be better used to reinvest in the business. It is unclear what impact shifting billions of dollars in taxes could have on Pennsylvania’s economy. This is a significant shift in tax policy and we would suggest further analysis be conducted to understand the impact it may have on consumer spending, hiring and other economic impacts. Dynamic modeling should be done to truly understand the impact these tax changes would have on the productive sector. Both the Governor’s proposal and HB504 promise property tax reductions which are directed primarily to residential homeowners. While some millage rate reductions would occur, the majority of small businesses would not see offsetting relief because the majority of small businesses do not own the building or land on which the business is located. For those that do own the building or land, we believe the slight reduction in millage rates offered under these two plans would be more than offset by the increases in the PIT and SUT. For these reasons, NFIB must oppose any proposal that increases the Personal Income Tax and Sales and Use Tax, even for the purpose of reducing property taxes.